They really are. If you are looking to share vegan food with a friend or loved one who is skeptical about it, bring them some raw vegan dessert and watch their doubts melt away like chocolate in the sun. Valentine’s Day is coming up and a decadent vegan treat like this one is a perfect gift to enjoy with your loved ones! It’s buttery, silky smooth and super rich. You won’t believe this is a raw vegan dessert, and neither will your Valentine! Raw vegan cacao (also called cocoa) butter is the key to the white chocolate flavor of this cheesecake. Cacao butter is the fat pressed from cacao beans, much like olive oil is pressed from fresh olives. BUT cacao butter is solid at room temp, which is how it helps this cheesecake hold it’s shape. Cacao butter has a healthy fat profile-it’s got a combination of omega-3 and omega-6 fats, and contains a number of antioxidants, as well! Of course the best reason to make this dessert is because it’s just so delicious it’s almost addictive. If you love chocolate, check out my recipe for Chocolate Blood Orange Cheesecake! For the crust, take a 7”-8” spring form pan and lightly oil the sides. Add the macadamia nuts to a food processor and pulse until the macadamias are broken up and crumbly. Add the chopped dates and sea salt and process un the food processor until the dates are well incorporated. The mixture should stick together when pressed in your palm. Transfer the mixture to the prepared spring form pan. Press the crust firmly and evenly into the bottom of the pan. Set aside until the filling is ready. For the filing, drain and rinse your cashews and place them in a blender. Add the chopped apple, vanilla, coconut milk, maple syrup, melted cacao butter. lemon juice and sea salt. Blend for 2-3 minutes or until the whole mixture is smooth. Pour into the prepared spring form pan over the crust. 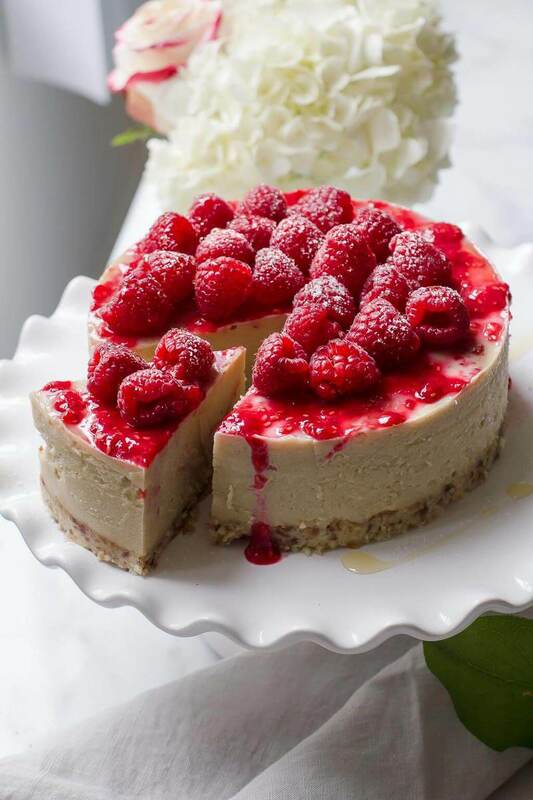 Place in your refrigerator overnight for the cheesecake to set up. To make the raspberry sauce, add 1 pint of raspberries, 2 tablespoons maple syrup, and the vanilla extract to a blender and blend for 1-2 minutes until a sauce is formed. Transfer to a container and refrigerate until ready to use. After the cheesecake has set up, remove from the springform carefully by releasing the sides and transfer to a cake stand or plate. 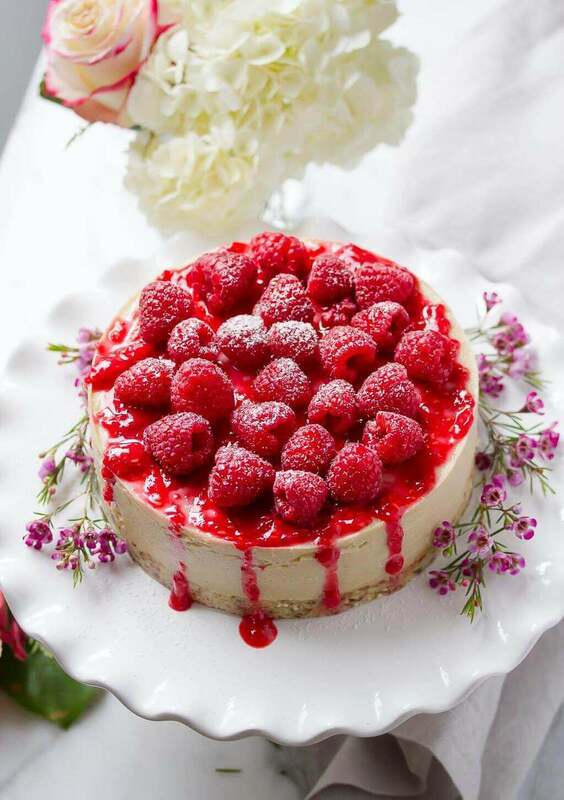 Spread some of the raspberry sauce on top of the cheesecake and garnish with fresh raspberries on top of the cheesecake as well. Dust with organic powdered sugar if desired.